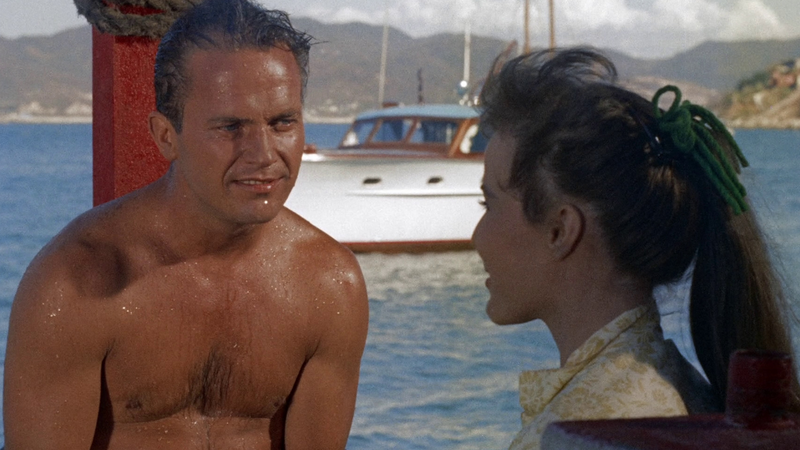 Trevor (Ralph Meeker) is a popular painter and highly decorated WWII hero. He and his new bride, Stella (Janice Rule) are on their honeymoon in Acapulco when trouble arises. Young women are turning up dead, and Trevor is accused of the murders. Since he suffers from post-traumatic stress, even he’s not 100% sure he’s innocent. He also has long stretches of amnesia where he can’t remember things. This film is directed by Paul Henreid who also stars in the film as Police Captain Henrique Monteros. The film certainly has an intriguing hook with a nourish hint, but somehow the final product feels lacking. Let’s take a look. I’ll admit that reading the plot summery for the film is what led me to request a copy for review. I hadn’t heard of this one before that, but it sounded like something I would like. While the acting is fine, cinematography and all, something just doesn’t feel right about this film. I think it’s the film’s pacing, for one. There just isn’t the sense of urgency that you might expect from this sort of thing. For a long while, we’re most certain Trevor is innocent, but the film doesn’t seem to care about the central mystery to make it worthwhile. I did some reading online and learned that Henreid said the studio didn’t understand the film and they cut out essential parts. That might be why the final film seems so lacking as the final film leaves much to be desired. A big misstep with A Woman’s Devotion is that we can never stand behind the man character. The film tries to squeeze mystery out of keeping Trevor in the dark where the audience is basically left to question his innocence. If it were changed up a bit where we see a man who know for certain is innocent, we might be more invested. This way it would make us take the journey with the main character as he fights to prove his innocence. As it stands, we just can’t care enough. With the film taking place in Acapulco, we can expect some strong visuals here. For the most part, the image has a clean look to it. There are only small traces of grain and other flaws, but they’re minimal at most. The 4K restoration is quite impressive as I sat and admired the visuals through much of the film. Details are strong without any softness of obvious flaws detected. In terms of visuals alone, this disc gets a strong pass. The image is AVC encoded. We get a DTS HD 2.0 track that never feels limited or lacking in any way. Vocals have a nice clarity to them and during the scenes with action or police sirens, we can expect to feel involved with the film. The music heard throughout the film also adds to the track as well. Along with the strong visuals, this track proves satisfying. I wanted to like A Woman’s Devotion, but it just never comes together. The plot moves at a sluggish pace, the central mystery is never as intriguing as it should be, and the ending is a disappointment. This Blu-Ray disc presents the film is a strong manner, but the film remains a letdown. Recommended only for already established fans.